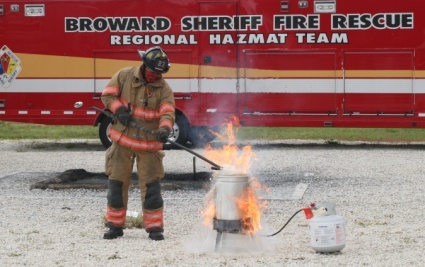 With the Fourth of July holiday weekend fast approaching, the Broward Sheriff’s Office Fire Marshal’s Bureau, BSO Bomb Squad and the Florida State Fire Marshal once again demonstrated the dangers of fireworks and the destruction they can cause. On a typical Independence Day, more fires are reported in the United States than on any other day. Over 10,000 fireworks related injuries are also reported each year, with over half of those occurring to children, according to the National Fire Protection Association (NFPA). There are no legal consumer fireworks in Florida. Only sparklers are legal for consumer use and can reach temperatures of 2,000 degrees – hot enough to melt gold – and can cause serious burns or permanent disfigurement. Broward Sheriff Fire Marshal Charles Raiken cautioned, “When things go wrong with fireworks, they go very wrong, very fast.” Just minutes after midnight on New Year’s Day 2009, a 41-year-old Broward County man was killed while detonating fireworks in his backyard. As for “celebratory gunfire,” it is against the law to fire a gun in the air – falling bullets have killed people in South Florida.